Congratulations to Phil for his getting through to and appearing on Sky Landscape Artist of the Year 2017 - on air on 18th October 2017! You can now purchase personalised Gift Vouchers for the sum of £25, £50, £75 or £100 which can be used for any course or workshop with availability within one year from the date of purchase. We are very excited that artist Nicola Lee, who has been attending our 'Intensive Drawing' course and 'New Experience' workshops with tutor Tim Morrison, has recently had her work exhibited in an exhibition in Taiwan. 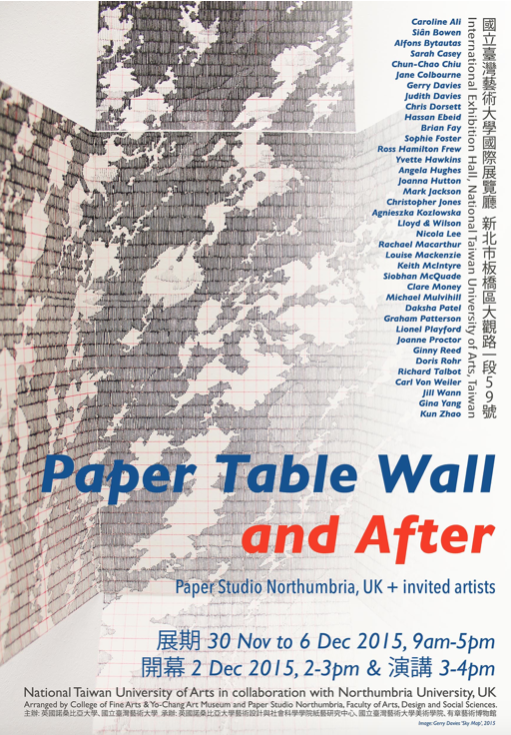 The exhibition by artists from Paper Studio Northumbria - Paper, table wall and after. was originally held 1st Dec. to 23rd Jan. 2015 at Gallery North, Northumbria University, Newcastle. The show then travelled to National Taiwan University of Arts in Taipei at the end of last year. Huge congratulations Nicola, look forward to seeing your work in the UK.